Jennifer practices classical Chinese acupuncture and herbal medicine, which places special emphasis on harmonizing the systems of the body, not only with each other but also with the rhythms of nature. By restoring smooth and even circulation, breath, and movement, her highly-individualized acupuncture treatments and customized herbal formulas can enable your body to re-activate its inherent healing abilities. In this way, your natural cycles of sleep, digestion, hormonal and reproductive function can realign with those of the natural world. In addition to having graduated with highest honors from a four-year medical program at the National College of Natural Medicine, Jennifer has advanced training in classical needling techniques, pulse diagnosis, and Chinese herbal medicine; has completed a 2-year intensive apprenticeship in medical qigong therapies; and has studied ancient and modern sound healing techniques from around the world. 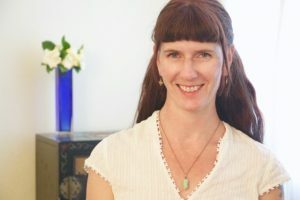 Although she does not currently offer treatments with massage-only, she has been a licensed massage therapist for 20 years, and incorporates bodywork – as well as her deep passion for anatomy and alignment – into most acupuncture sessions, she also uses the onega foot massager for some of her packages. Among Jennifer’s greatest joys are international travel; practicing yoga; dancing in the streets or a salsa club; making medicines; being in or on the water; watching the antics of birds; gardening; qigong; playing music; and watching the Mississippi River roll by. Please schedule an appointment online here. You may also call or text 504-810-5692 if you have any questions, or if you are unable to schedule online. Community acupuncture coming soon; please check back or call to learn more.